Over 200 attended the official grand opening of Webster Orlando's new location downtown. The new space replaces two previous locations and situates students in the heart of the growing city. 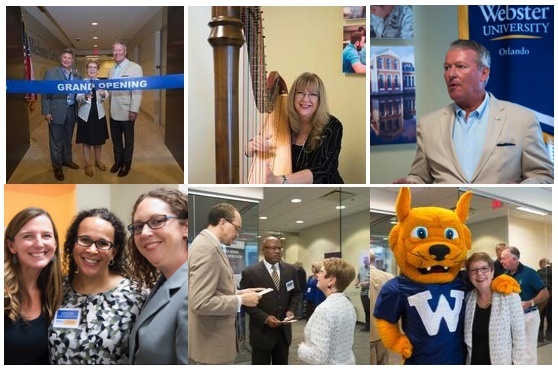 Orlando Mayor Buddy Dyer joined Webster University President Elizabeth (Beth) J. Stroble and Webster Orlando Director and Central Florida Regional Director Nick Spina with more than 200 others to celebrate the grand opening of Webster's new downtown Orlando campus on Tuesday, Aug. 2. 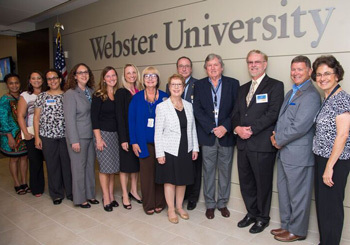 In addition to Webster alumni, faculty and staff, attendees included representatives from the City of Orlando, Economic Developments Commission, local business leaders and more. Webster Orlando staff join President Stroble at the opening. The new site – 501 W. Church St. – is across the street from the Amway Center, home of the Orlando Magic basketball team, within walking distance from many major downtown corporations and only blocks away from the proposed Creative Village educational hub. "So Mayor Dyer, we join you in your vision for Orlando's future," Stroble said. "We are committed to doing our part to make that vision come true. Orlando is a great place to call home, and Webster is grateful to truly be at home in this great place." The new space is about 37,000 square feet. The space has 11 state-of-the-art classrooms, 2 computer labs, 2 conference rooms with breakout spaces, 10 offices and video conferencing capabilities for WebNet+ classes. See other photos on Webster Orlando's Facebook page.